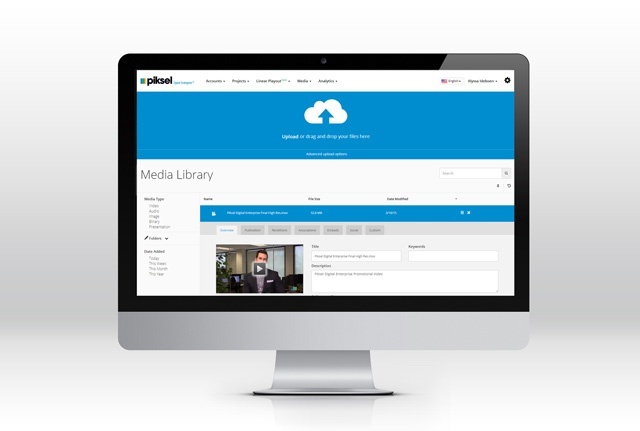 We’re very excited to announce our newest version of Piksel’s Online Video Platform with the 6.0 release. Along with this release comes with a new name – Piksel Digital Enterprise™. Much like the lightweight, yet highly functional Star Trek Starship Enterprise, we’ve modeled the Piksel Digital Enterprise platform with some incredible new features, sleek functionality, and important updates. Check out the video below to see some of the coolest features of this release. One of the best parts of Piksel Digital Enterprise 6.0 is its sleek New Media Library. We’ve done some significant updates that will allow you to drag and drop your assets immediately. You can ingest your videos with a single click – offering you the opportunity to choose a universal transcode profile or one of your own choosing. The beauty of Piksel Digital Enterprise 6.0 is it allows a user to operate from a single-page workflow. Another feature of the new interface is Drawer-Based Workflows. Navigate quickly through each drawer to syndicate and socialize your video to your favorite platform or network. We’ve also included additional programing options to allow you to further customize your media content. Additionally, we’ve improved the search and share functionality; making it possible with a few pre-selected buttons to sort your assets among thousands. You can share the URL to colleagues (keeping the search parameters intact) and multi-edit a selection of assets with just a click. Remember how Data, the android character in Star Trek, had a seemingly endless supply of relevant information to offer at a moment’s notice? Our new online help portal is similar to Data’s job. Mobile-responsive, and chock-full of information relating to every process on the Piksel Digital Enterprise platform, the online Help Portal makes it easy to learn. Enter the topic you are interested in learning more about in the search bar to narrow down your options. Get more done in less time. It’s as simple as that. We strive to make it easier and more enjoyable to operate within the Piksel Digital Enterprise platform. If you are just hearing about Piksel Digital Enterprise for the first time we'd love to show it to you in person, book a demo.